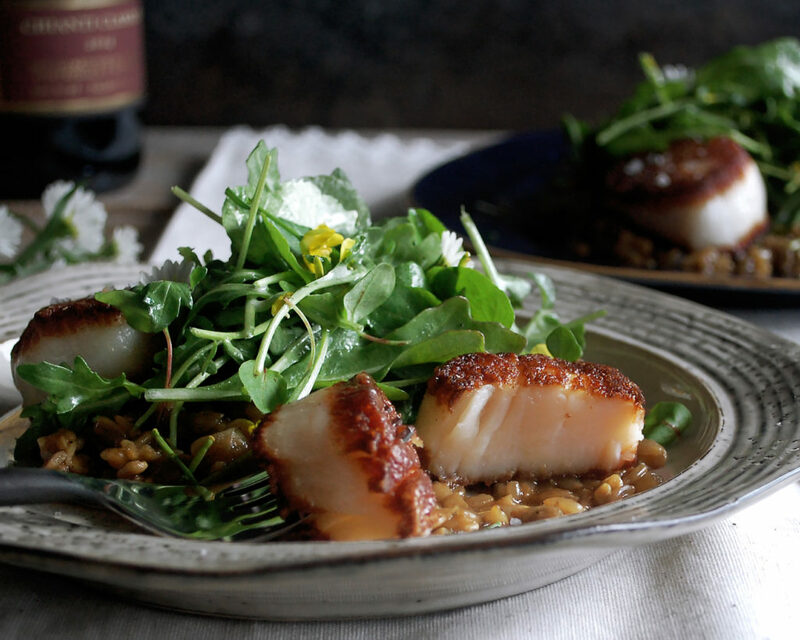 An interesting take on risotto, plus some seriously good tips for searing scallops. A few years ago, I ate at Elizabeth in Chicago and had one of the most memorable, mesmerizing meals of my life. 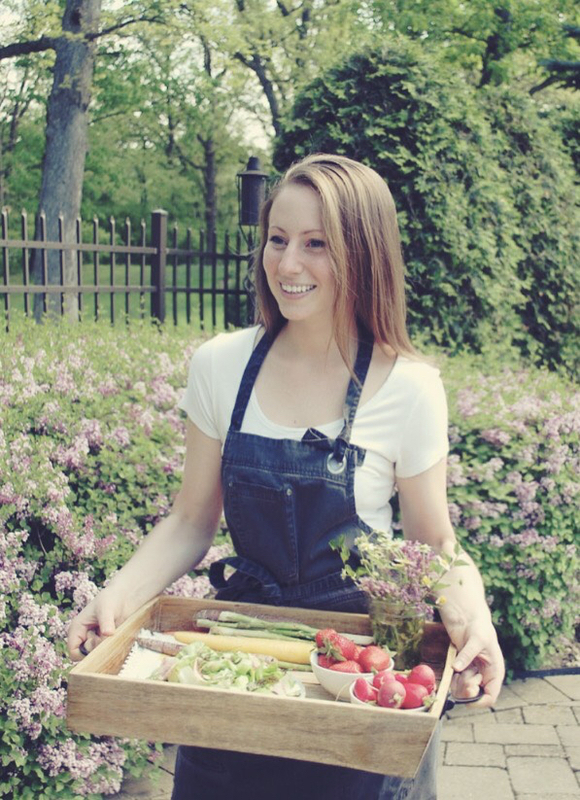 The food focuses on foraged, seasonal ingredients inspired by nature. From the minimalist plating to the unique flavors, everything made you feel extremely connected to the earth. It was outstanding. The one dish that stood out for me was a sunflower seed risotto, beautifully prepared with garden flowers on top. That dish has stuck with me, and ever since I’ve wanted to try using sunflower seeds in replace of the rice in a risotto. 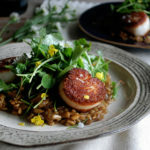 While I’m not exactly sure how they cooked it at Elizabeth, I came up with my own version that works great with seared scallops and a creamy arugula salad. You can’t eat this risotto like a normal one, though (big spoonfuls at a time). It’s treated more like a garnish to the scallops. The process of making risotto with Arborio rice is basically applied to sunflower seeds. The biggest difference is the level of starch and creaminess in the finished product. The rice slowly absorbs liquid and releases lots of starch, making a very creamy risotto. The sunflower seeds don’t quite have this ability, but the slow additions of stock do still get absorbed. The result is a flavorful, slightly crunchy “risotto” that has a beautiful nutty flavor. The first thing to do is to get the stock heating. Never add cold stock to a risotto. While it’s heating, you simply sauté some aromatics in a pot (onions and fresh thyme for this recipe). You then want to add the sunflower seeds and let them toast slightly, developing their natural nutty flavor. The stock then gets added just like you would in a risotto, slow and steady. It’s a long process for one dish (about 35-40 minutes of straight stirring), but it’s worth it and somewhat relaxing. Little by little the stock will get absorbed and the seeds will start to bloom. The finished result won’t have the consistency of risotto, but the seeds will have softened and taken on lots of flavor. You’ll want to flavor the “risotto” even more with a good seasoning of salt and black pepper, along with some freshly grated Parmesan cheese. 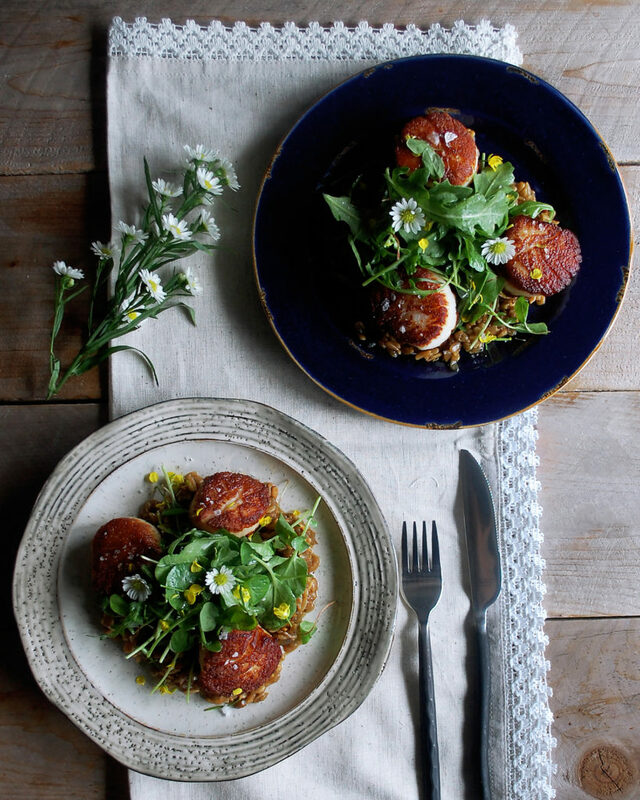 The next component to this dish is a simple arugula and watercress salad. A key factor to making a good salad is the dressing. First, the dressing needs to be seasoned very, very well. When you taste the dressing on its own, it should be somewhat overpowering. Once you add it to the greens, the flavor of the dressing will dilute. It’s difficult to season the greens themselves, so the key is to make a powerful dressing. The next thing to be aware of is the amount of dressing being used to dress the salad. Start small, and you can always add more. The dressing should effortlessly coat every inch of arugula/watercress (or whatever other greens you might be using) without completely drenching them. This is a skill that takes some time to master, believe it or not. When I was working at Bouchon Bistro in Napa, we had a whole lesson just on how to dress a salad because so many chefs over or under-dress them. Lastly, you want to toss the greens and dressing very gently. Don’t be too aggressive or crush the greens with tongs. Drizzle in the dressing and then use your hands to gently toss everything together. 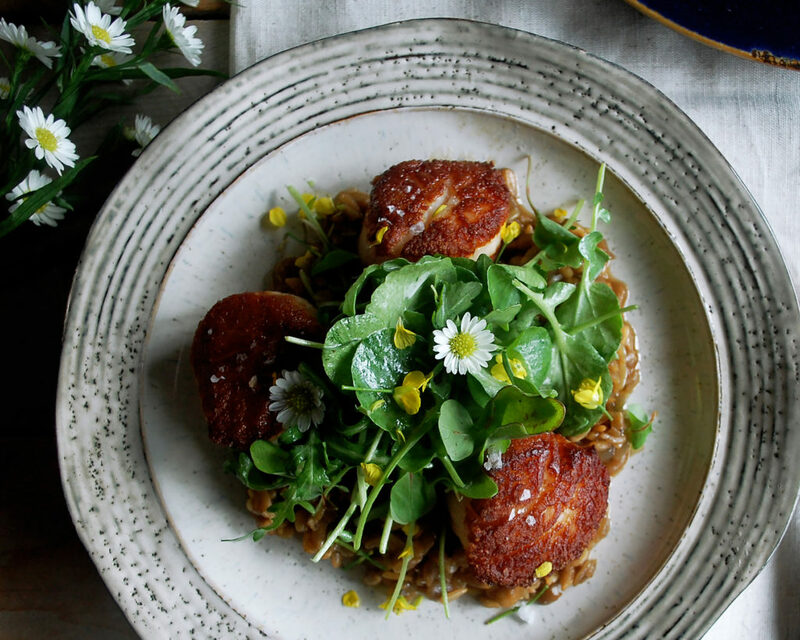 The last part of this dish is the scallops…my absolute favorite seafood to cook. I love the crispy exterior and buttery texture. They work well with the deep flavor of the sunflower seed risotto and the tangy salad. Cook them last so they can be eaten fresh out of the pan. 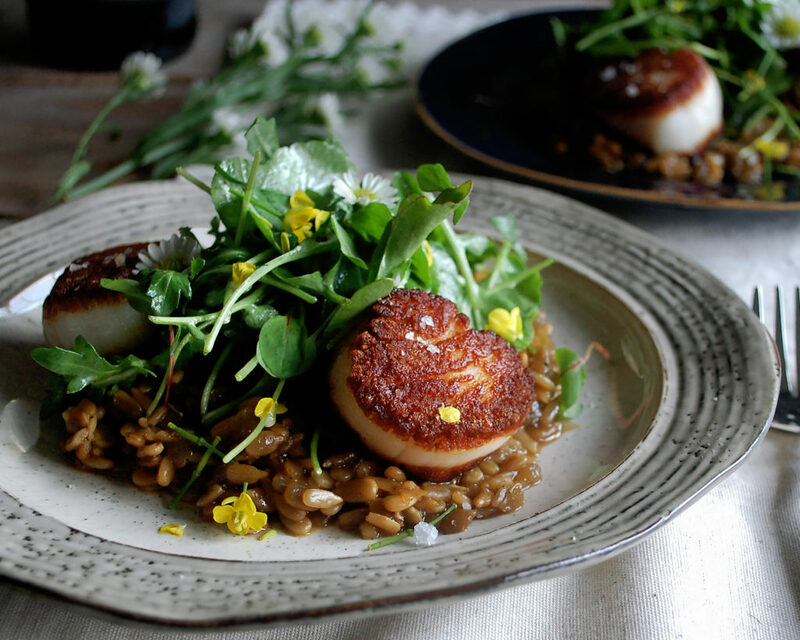 There’re a few tips to searing scallops. I’ve outlined very similar steps when discussing how to make these pork chops, because the same principles apply to searing most seafood, meat, or poultry. Let the scallops sit out at room temperature for a good 30 minutes. This allows the scallops to relax and essentially prepare for the shock of the heat. Use paper towels to pat them dry. You want them to be completely free of moisture before hitting the pan. Use an oil with a high smoke point such as vegetable or canola oil. Heat the oil over medium heat so that it doesn’t heat too quickly. If you heat it over high heat, the scallops will tend to burn before searing once they hit the pan. Keep the heat at medium and be patient while the oil heats up…and make sure that oil is sizzling hot! I like to test a breadcrumb in the oil to make sure it sizzles before adding the scallops. Don’t overcrowd the pan. If you have the scallops too close, they will steam and you will end up with soggy sides instead of a golden crust. Work in batches if needed to give the scallops a good amount of space. Once the scallops touch the pan, leave them alone. If you try flipping them before they’re ready, they’ll stick and tear. Give them a good few minutes before checking. Once seared on one side, flip them, add some butter, and baste for about 30 seconds to finish cooking. Be extremely careful not to overcook the scallops or they will be tough and rubbery. Hopefully these tips and tricks will be useful. They can be applied to this dish and countless other recipes. Having good fundamental techniques in your back pocket will make all your food a lot more delicious. Enjoy! Add the stock to a small saucepan and heat over low heat, just to warm through (don’t let boil). Heat a few tablespoons of oil in a separate medium-sized, heavy-bottomed pot. Add the onions and sauté until translucent. Season with salt and black pepper. Add the sunflower seeds and let toast for about 2 minutes in the oil. Add the fresh thyme. Slowly begin to add the warm stock in ¼ cup increments, continuously stirring the seeds. Add more stock only when the seeds have absorbed what’s in the pot. This process will take about 35-40 minutes for the seeds to absorb all the stock. Grate the parmesan into the “risotto” using a microplane, about ¼ cup. Stir to combine. Taste for seasoning; add more salt or black pepper if needed. Serve warm. Whisk together the fresh orange juice, sherry vinegar, and mayo. Slowly drizzle in the olive oil, whisking to emulsify the dressing. Season with salt and black pepper to taste. Toss the arugula and watercress together in a mixing bowl. Wait to dress the salad until right before serving so that the greens do not get soggy. When you’re ready to serve, add a small amount of dressing to the greens and use your hands to toss. Slowly add more dressing if needed, little by little. Store any extra dressing in an airtight container in the refrigerator for future use. Remove the small, tough muscle off the sides of each scallop. Pat the scallops dry and season with salt & black pepper. Heat a large pan over medium heat (you may need to use two pans to fit all the scallops; you don’t want to overcrowd the pan). Add enough oil to generously coat the bottom of the pan. When the oil is sizzling hot, place the scallops, flat-side down, into the pan (the oil needs to be extremely hot so that the scallops do not stick). Let the scallops sear for a few minutes (without messing with them) until they’re dark brown, but still golden. Flip each scallop over and add a spoonful of butter. Baste the scallops with the butter for about 30 more seconds to finish cooking. Be careful not to overcook the scallops or they will be rubbery. Serve immediately. 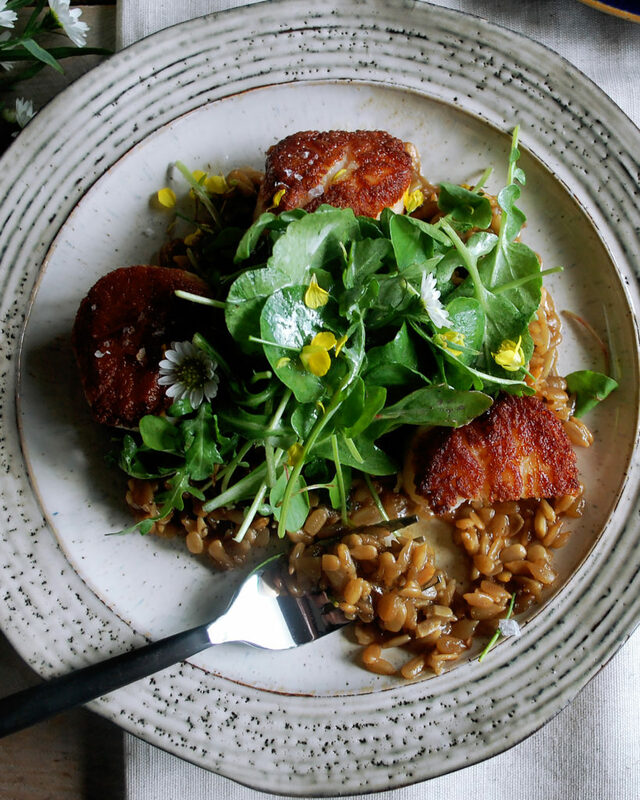 Serve a small spoonful of sunflower seed risotto on a plate. 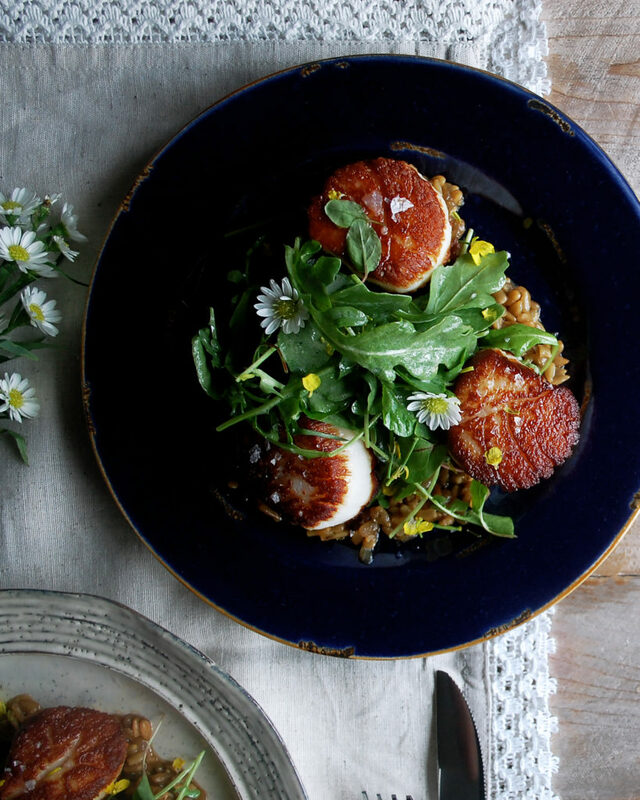 Arrange the scallops on top with a sprinkle of maldon salt on each one. Finish with a big mound of arugula salad in the middle.